With the recent wet weather and flooding, it was only a matter of time before I turned up at a parkrun venue to find it cancelled. That day was today. You see, today's parkrun tourism was supposed to be take me to Pegwell Bay parkrun, near Ramsgate. In fact it did take me there, but about 5 minutes after arriving, I heard the word that no parkrunner wants to hear, especially after driving 63 miles, that word was the 'c' word (cancelled). I returned to Pegwell Bay and ran it two weeks later. It was now 8.20am and I had two alternative parkrun venues that I could potentially reach before 9am. 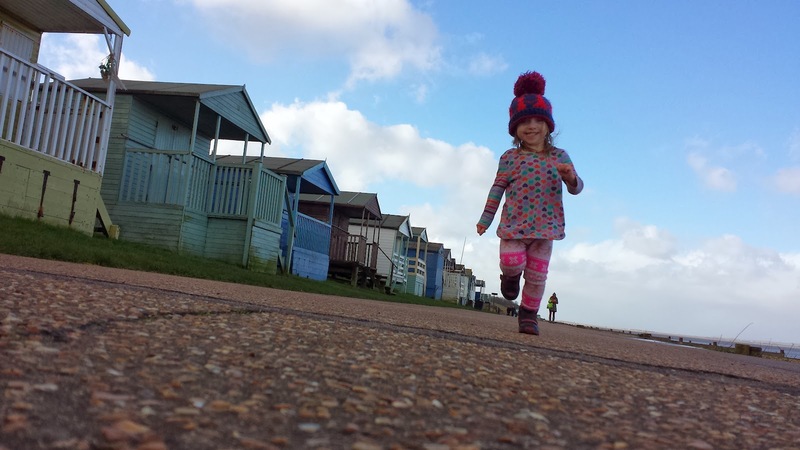 Margate parkrun which is just a short drive north was the easy option. However, I already had a plan b lined up (always have a plan b and c! As I had already run at Margate parkrun, it was my plan c). In anticipation of a potential cancellation I had already checked how long it would take to get from Pegwell Bay to Whitstable (29 minutes). So back in the car and off we went back in the direction we had just come from, listening carefully to my phone's sat nav app telling me where to go and following it even when the road signs told me to go the other way! 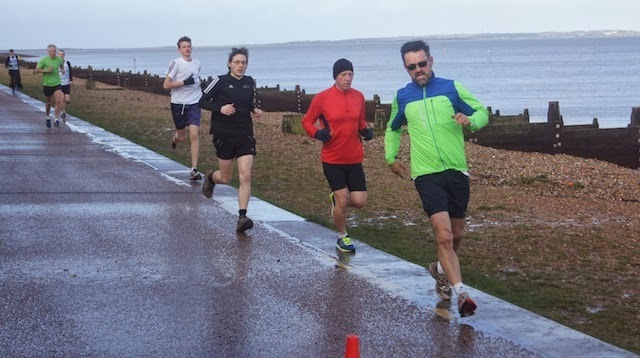 We drove through a torrential downpour complete with hailstones, which was so severe it also had the Whitstable parkrun team seriously considering a cancellation. Eventually we reached the seaside town and located the start of Whitstable parkrun, the only problem was that all of the on-road parking had been used up by other people. Eventually we found a space (with a 1 hour maximum stay) about 1km away from the start, I changed my shoes and had a panic-run back over to the meeting point. I arrived at the meeting point, which is next to the kiosk/toilets (there are also bike racks here) just off of Marine Parade with just enough time to catch my breath before heading down to the lower level of the promenade for the run briefing. 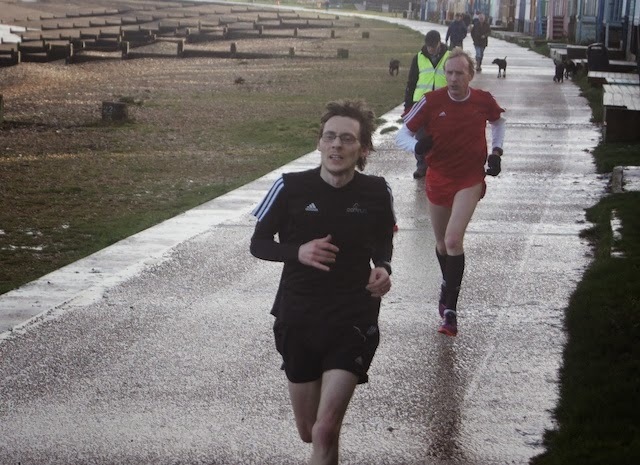 Whitstable parkrun hasn't been completely immune to the recent wet weather and the normal course had been modified to avoid the waterlogged grass area that are usually used for part of the run in favour of a double out-and-back course all on tarmac/concrete paths. The run actually takes place in Tankerton, which is a suburb of Whitstable. The start of today's run (bear in mind that it's not the normal course) saw the runners head eastward with the stone beach on their left (make sure you don't fall off the path and onto the beach!) and the Tankerton Slopes on their right. The slopes are a site of special scientific interest (SSSI) because they support the largest single population of the large umbellifer hog's fennel Peucedanum officinale (a medicinal herb) in Britain. 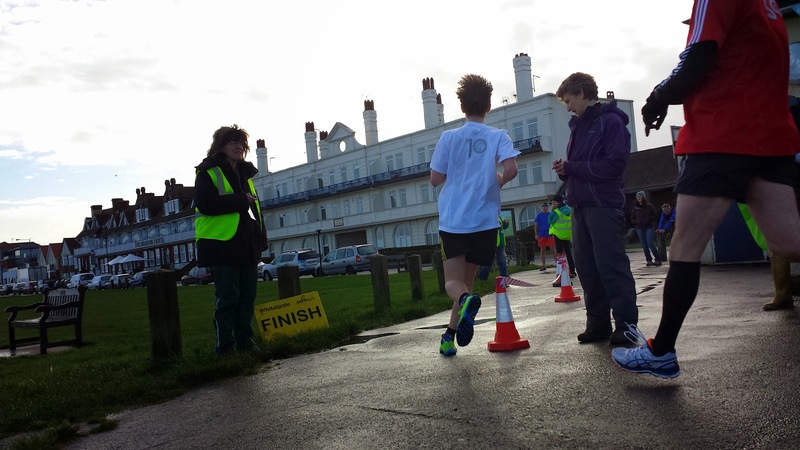 The course went out for about 1.25k, where there was a marshal and a turnaround point in front of the highly desirable beach huts (£75,000 worth of desirable, so I read). Once the leading runners had turned around, the course became two-way for parkrunners, plus there were other users including cyclists, dog walkers etc. So it was good to see all of the runners following the advice from the run briefing and sticking to the left. So once turned around it was a case of running back to the start area for the next turnaround point and then to run the out-and-back again. We also had the added bonus of a skip on the path to avoid. Here, there was a marshal and some cones to keep the runners in the right part of the path. All beautifully done, I might add. So after completing the out-and-back for the second time, it was time to head to the finish. After running at quite a hard pace, I was hoping that it would be on the lower level. However, it wasn't. So after a 180 degree switchback turn, the 120 runners had to run up the steep slope towards the kiosk to collect that all-important finishing token. I can't even remember having my barcode scanned, but I must have because I appear in the results for event 173. Anyway, shortly after finishing, I headed down to the beach with the ladies to explore, look for shells and the things you do on a stony beach. We them bumped into Jacky, the event director who is also parkrun's ambassador for Kent. I had heard of her, even mentioned her in my Ashford parkrun blog post / So Let's Go Running article, but had never actually spoken to her. After a brief chat, she asked if we'd be joining them in The Lounge for post run beverages and after moving the car into a new parking space (also max stay of 1 hour), we did and chatted about parkrun some more. Buggy runners would be absolutely fine on this course - although if the photo of my daughter is anything to go by, we might not need ours for much longer! The normal course would also be fine but involves a few trips and and down Tankerton Slopes and also a grass section. What else have I missed? Oh yeah, there's a train station in Whitstable, it's about 1.3km away from the start so is well within walking distance. 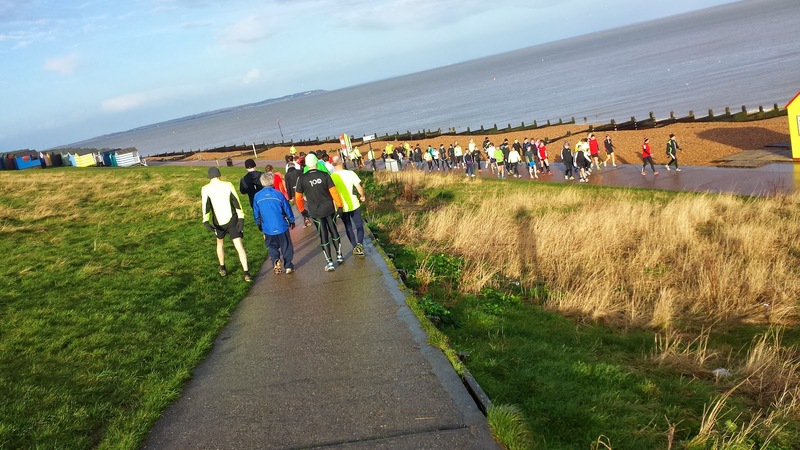 Whitstable parkrun is one of those venues that is clearly a well-oiled machine. It is, after all, the original Kent parkrun and has been active since November 2010. Of course, I'll have to come back to run the proper course at some point. My wife commented that it had a similar feel to our home parkrun in that it felt like a big family and that is something very special indeed.